CPR rescuers at the right time and place can mean the difference between life and death for a victim of cardiac arrest. Cardiopulmonary resuscitation is a set of skills used to restart the heart in case of cardiac arrest and restore the spontaneous circulation of blood through the body. Cardiac arrest occurs when the heart stops beating, typically due to a myocardial infarction – or in laymen’s terms, a heart attack. CPR skills includes chest compressions, rescue breaths, and defibrillation – all used to try and restore the circulation of blood in the body. Adequate chest compressions are the most important part because they manually pump the heart and get the blood circulating. Chest compressions should be at least 2 inches deep, and done in a ratio of 30:2 with rescue breaths. 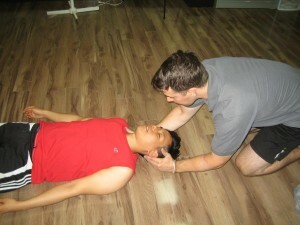 When assessing a victim who has fallen unconscious, check for responsiveness, a pulse, and breathing. Basic Life Support classes are short and focused on CPR skill building. They last around four hours, and teach students how to give 1 or 2-person CPR, including basic first aid and defibrillation training. AEDs are used to send electric shock the heart and attempt to restart it. There are no pre-requisites for BLS training. All of them are certification programs wherein students need to pass a set of post-tests to get certified. Only one of the programs has optional certification – Heartsaver CPR/AED, a class for the general public. The post-test for that program is a skills test, all other post-tests are practical and written tests. 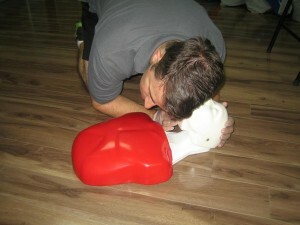 Basic Life Support for HCPs – 4.5 hours, teaches 1 and 2-person CPR, first aid, AED, and the 2010 BLS guidelines (AHA). In giving rescue breaths, stabilize the head (if there isn’t a neck injury), tilt it back, and thrust the jaw open. ALS programs are only for healthcare providers (HCPs). Students are required to have a valid BLS for HCP training certificate to qualify for ALS training. ALS programs teach students how to manage cardiac arrest in a medical setting, such as a hospital. Trainees are taught how to use equipment such as bag valve masks, ET tubes, and manual defibrillators. Basic ECG use and ECG tracing reading is also part of ALS curriculum, along with complete assessment and pharmacology, for either adults or pediatric patients. Advanced Cardiac Life Support – 16 hours (2 days), teaches medical management of cardiac arrest in adults. Adult pharmacology, assessment, first aid, and AED training are part of the program. Re-certification is 5-6 hours. Pediatric Advanced Life Support – 14 hours (2days), teaches the same curriculum structure as ACLS, but for pediatric victims. CPR for infants and CPR for younger children as included in the program as well, and how they differ from CPR for adults. Pediatric pharmacology is an important part of PALS training. Re-certification is 6-8 hours.